This is probably the most frequently seen enameled pattern. 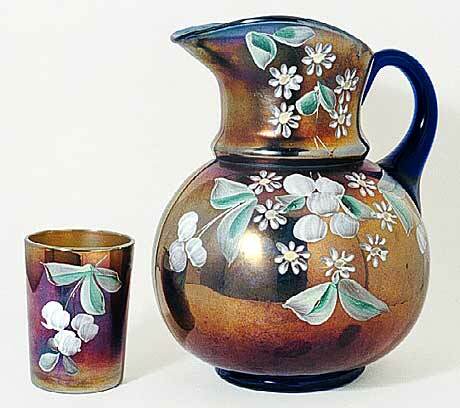 The pitchers may be called Cherries, Cherries and Little Flowers, or Cherries and Blossoms. The tumblers, lacking the small flowers, are all called Cherries. Both Fenton and Northwood made sets decorated in this design. They are impossible to tell apart except for the occasional Northwood mark. James Measell, Historian for the Fenton Art Glass Co., points out that the Northwood version of this pitcher has four mould joint marks (one under the lip and one under the handle with the other two at 90-degrees from these). The Fenton version has two mould joint marks (one under the lip and one under the handle). There are some subtle differences in size, but the joint marks make it easy to differentiate between the Northwood and Fenton versions.